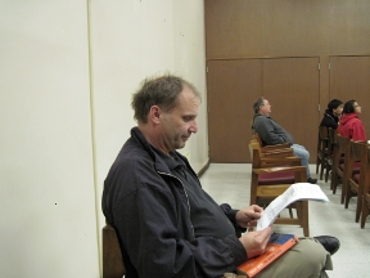 James Rowen in Santa Clara city council chambers carefully studying the agenda. Is he more than just a political consultant for the Stadium Five. Is he a svengali for some of them, in particular, Patricia Mahan, Dominic Caserta and Jamie Matthews? After years of being an aggressive advocate for slander, lying and junior high insults of citizens of the city of Santa Clara who oppose policies and pet projects (e.g., San Francisco 49ers Stadium) of Santa Clara politicians via his blogspot blog, James Rowen has finally been taken to court to defend his words in a civil lawsuit. He is being sued in The Superior Court of California, County of Santa Clara for what they categorize as "Defamation - Unlimited". They may have picked, or possibly created that category after a thorough perusal of the blogging of James Rowen over the years. The File Date was August 7, 2013 and the Case Number is 1-13-CV-250808. Does Crime No Longer Pay? Lantern is closing shop. We have a lot of fun over the years, but we have decided to redirect things to more serious and more independent views and also renaming the site. We will be off for the next week, and reopen with some very important points. It is not clear whether Rowen is using the editorial "we" or is referring to the Santa Clara Stadium Five and other politicians who have hired Rowen such as Andrew Ratterman and Robert T. "Bob" Owens. He says "more independent views". 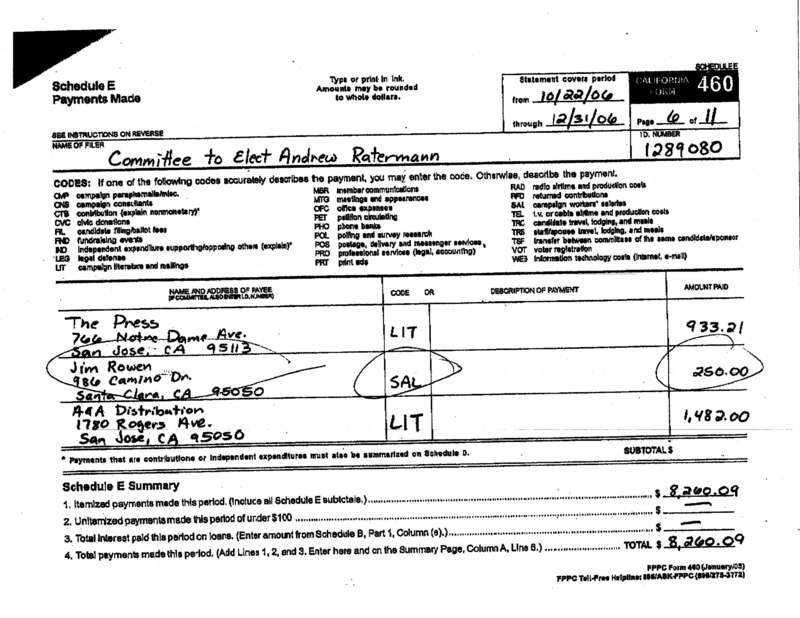 Could Rowen be confirming what many have suggested - that career Santa Clara politicians Patricia Mahan and Jamie Matthews and other local politicians are paying Rowen to libel, lie and name call citizens who oppose their policies and candidates running against them? To tarnish any decent citizen of Santa Clara who speaks against a city policy during public comment at a city council meeting by referring to them as "bigot boy", "trailer park queen", "segregationist" and worse? The question is raised: did Rowen's constant bile, his never ending stream of hate, his daily ritual of calling men bigots and racists and women fat and ugly eventually get to be too much for the politicians who paid for it? Or is he pretending those weren't solely his own personal comments since he is having a harder time getting paychecks from politicians as a result of his vile blogging? As his body of work is so heinous, so abominable, short of a death-bed confession, we will likely never know the answer. A Perfect Match for the Santa Clara Stadium Five? 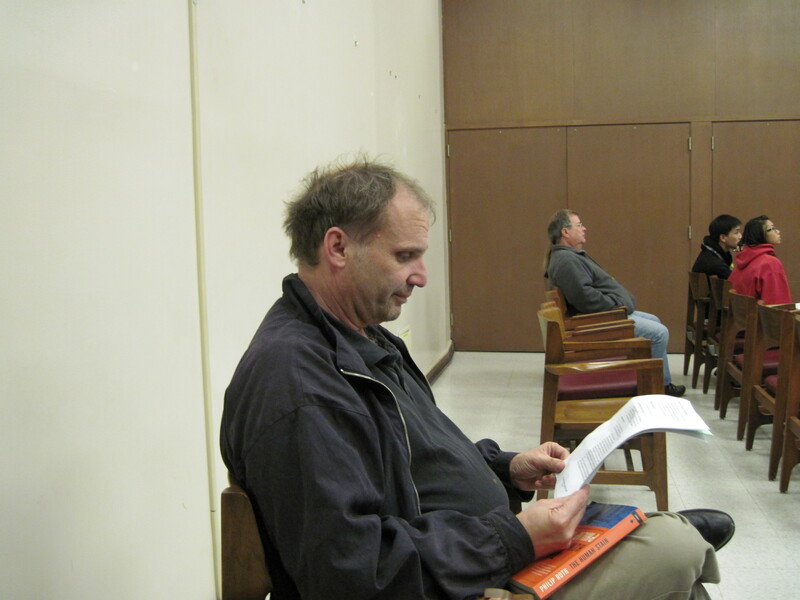 Although his online lying, rants, libel, false quoting, childishness and overall lameness have earned James Rowen the nicknames of "Santa Clara's Village Idiot", "Pig-Pen" and "An Aggressive Advocate for Libel"; inside City Council chambers it's a different story. Rowen has been a political consultant for Jamie Matthews, Dominic Caserta and Kevin Moore. 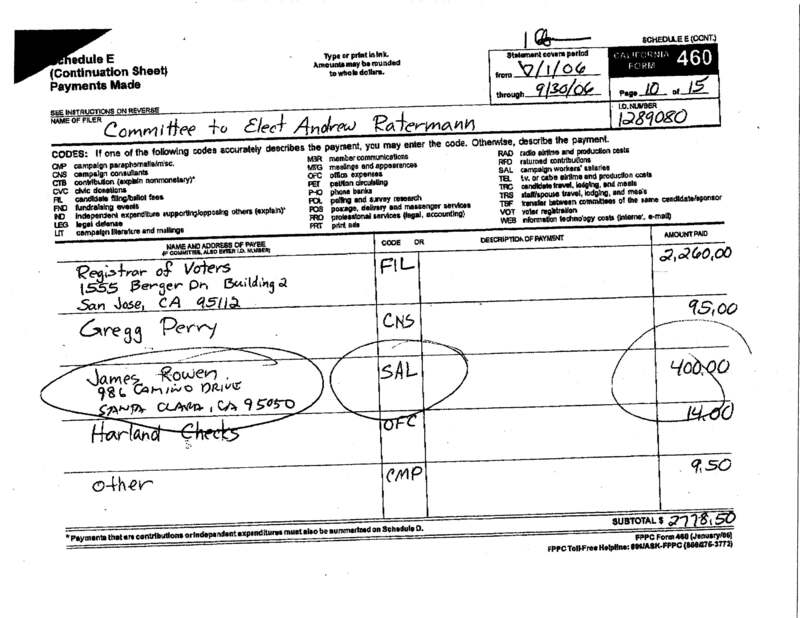 Career Santa Clara politician Patricia Mahan used Rowen in her 2010 political campaign, presumably for his demonstrated "talent" cyber-harassing anyone who criticizes or disagrees with her political deeds and alliances. The hiring of Rowen, despite, or more likely, because of his despicable cyber-harrasment of Santa Clara citizens and political candidates, says a lot about the ethics of Santa Clara politicians. Not to mention those of Santa Clara Unified School District member Andrew Ratermann, who used Rowen for his 2010 relection campaign and West Valley-Mission Community College District trustee Robert T. "Bob" Owens who has hired James Rowen to help with his 2012 reelection. He is well respected by the Santa Clara Stadium Five and they can often be seen looking to guage his opinion on issues brought before the council as he sits in the audience at each city council meeting. There is suspicion that his disheveled mustard-stained appearance and pinched-face expression is a ruse to disguise a svengali or puppeteer relationship with some of the councilmembers. However, Rowen is not believed to be currently working for councilmember Kevin Moore who called him an angry ball of hate in a 2007 San Jose Metro article. In contrast, there are also a few people in Santa Clara who consider James Rowen to be nothing more than a dishonorable vile human being who after attacking anyone who challenges the city council on anything, turns into a groveling sycophant when addressing the council, with the hope that at some point they will select him for the Santa Clara Planning Commission. A word of caution regarding James Rowen. He was charged with battery on a female transit employee while using gender-based epithets, and later plead no contest to a charge of disturbing the peace. He has shown himself to be a crank with both a bark and a bite! The gender-based epithets suggest that females should be especially wary when encountering James Rowen in the Santa Clara City Council Chambers. Does the Santa Clara Stadium Five Hire James Rowen to Lie and Libel For Them? The Santa Clara Stadium Five are pushing hard for a taxpayer subsidized 49ers stadium in Santa Clara. Stadium Five members have hired James Rowen for various tasks. Since he clearly lies about what stadium opponents are saying or doing, you have to wonder if the Santa Clara Stadium Five are paying him to libel stadium opponents. Bailey said today that only people in 95054 have a right to comment. The 49ers headquaters are in 95054 so are the hotels and so is several stadium boosters. Bill, why is a person in 95051 trying to filter comments? You have some emotional issues? Monday, November 16th: Study Session, 6:00 to 8:00 p.m. ....Presentations by Planning, the 49ers and the City Manager. Wednesday, November 18th: Application & EIR, 7:00 p.m. ....Review and comment. We appeal to neighbors in the 95054 area in particular: The $114 million subsidy affects us all - but the traffic, police checkpoints and road closures will affect you especially. Rowen's go to move is to make up a quote involving race and then charge that the person he is claiming said it is a racist. Rowen is fond of suggesting that anyone who mentions the possibility of the 49ers building a stadium in the Hunters Point section of San Francisco is racist since that will impact a neighborhood with a large amount of African Americans. So clearly, by his own logic, James Rowen is racist since the Santa Clara 95054 neighborhood that will be impacted negatively by the 49ers stadium that he is cheerleading, is mostly non-white. On 12/22/2009, Rowen posted: "JUAN PARDELL OF THE ANTI STADIUM GANG, DEMANDS HIS TREE FIDDY" and then embedded a link to a youtube video (titled "Tree Fiddy") that has two white guys pretending to be black in a demeaning racist way. (Juan Pardell is someone who gives the facts about the Santa Clara San Francisco 49ers stadium on various newspaper message boards - often in rebuttal to James Rowen.) It begins "Say, would you crackers like to hear about the time we saw a Lochness Monster?". The video goes downhill from there. One of Rowen's favorite lies is the nonsensical statement that someone with a website opposed to Santa Clara subsidizing a San Francisco 49ers stadium "has linked it to the Minutemen and other right wing militia groups". While that garbage is never true, it is true that James Rowen has linked his blog to a racist youtube video. And some city council members pay money to someone with such pathetic and dirty behavior... Although it has been speculated that some of the money he receives from the city council is payment to stop him from libeling or attacking THEM! And so he sits in his childhood home spending his day blogging lies, libel, name calling, false quotes and linking his demented hate speech to unrelated videos and images. Nothing is sadder than when he pretends to be an internet visitor commenting on one of his own blog entries. And not satisified with polluting the web on his own blog he also adds his hate speech to newspaper forums, posting as himself, making up names and posting in agreement with his previous post, or posting using the name of someone who opposes a Santa Clara policy and then making outrageous nonsensical statements. One can only imagine the pain, sadness, despair and loneliness in his life that would cause him to lash out with a continual stream of lies, hatred and anger. The San Jose Metro refers to Rowen as a Santa Clara political bottom-feeder. They may have been referring to this - it has been said that James Rowen will offer people applying for Santa Clara Planning Commission approval his services - saying he can make it happen for a fee. If true, it is extremely disturbing that money can influence the Planning Commission process in Santa Clara. As someone who depends on the crumbs of Santa Clara politicians like Andrew Ratterman, James Rowen has mastered sycophancy. Here, while attending a Santa Clara city council meeting, he shows you one trick of the trade. Wear a dress shirt, but wear it inside out. Why inside out? For one, it illicits sympathy and can make a politician more likely to toss some campaign contributions your way to perform some campaign-related task. But two, it is also a little disturbing and makes them worry what may lurk behind the fealty - perhaps you're a crazy crank who could turn on them. 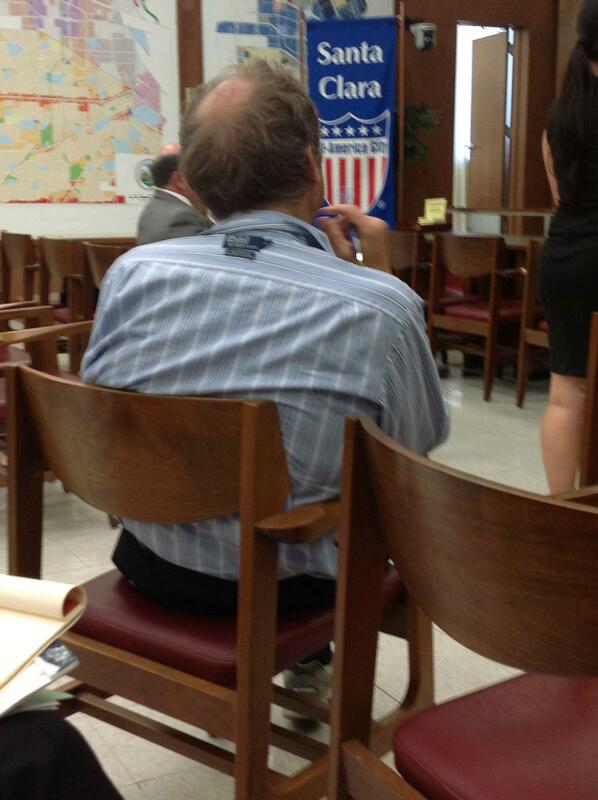 So the shirt gives another reason to toss some campaign contributions your way. The incongruity of black dress pants and tan running shoes completes the look. James Rowen is lucky enough to have his own tribute blog: Mission City Loser, which works to answer the question "Who is James C. Rowen?". The Mission City Loser provides insight into the life of James Rowen, covering everything from his dishonesty and unethical and immoral behavior, to his allegiance to the corrupt Santa Clara Gilmore machine politicians and his long-term joblessness. It is widely believed that no able-bodied man in the history of the city of Santa Clara has worked fewer hours for his age than James Rowen. But why work when you can spend your days sitting in your lifelong home telling lies and libeling decent people who are against some of the policies of the politicians of the City of Santa Clara? While some would call it pathetic, others would use the term sick, James Rowen has nevertheless found his calling - inheriting enough money to live without working and using his free time using lies and libel to try and thwart democracy and opinions and intimidate citizens in Santa Clara. Update: due to the death of his mother in 2011 the Rowen family home was sold in January of 2013.